We’d love your help. Let us know what’s wrong with this preview of The Secret of Willow Inn by Pat Nichols. Pregnant with her first child, Emily Hayes is eager to help her mother finish transforming an estate into the Willow Inn and write a novel about Willow Falls’ colorful history. A tragic event threatens her parents’ plans to refurbish an abandoned hotel and transform Two women fighting for their dreams, one who’s long lost hers, are united by tragedy and a long-held secret. To ask other readers questions about The Secret of Willow Inn, please sign up. The Secret of Willow Inn is a gem and I am thrilled to find writing of this quality in the Christian fiction genre. This story beautifully combines elements of relationship drama and women’s fiction in a character-driven narrative that is hard to put down. A favorite of mine, for sure! The vividly-conveyed setting of Willow Falls is a typical north Georgia town, and that this story takes place in my state is an added bonus. Locations and places of business, from Atlanta to outlying areas, convey a cozy sense of place. And as in any small town, you can expect to find some gossip, financial worries, tragedy, and mystery – as well as a romance, caring, and coming together when the situation demands it. A strong ensemble cast adds richness and depth, and makes me long for more stories in this series. Emily and Rachel might come from totally different places – rural vs. big city – but they have a lot in common, unfulfilled dreams being one example. Suspense builds around a 30-year old crime as Emily’s friend, Pepper, hires the ex-con Sadie to work in her café. The Secret of Willow Inn is well written and heartwarming, with some unexpected elements added along the way. I highly recommend this story and am eager for the next book in the series. Pat Nichols captures the small town in the first book in her Willow Falls series. The little Georgia town is full of opinionated residents who don’t hesitate to voice their opinions when controversy strikes. And there is plenty of drama in Willow Falls. First, there’s the return of Sadie Lyles. A woman who spent the past thirty years of her life in prison for murder. Then there’s the matter of opening the inn and hotel. When news of another venture reaches the town, everyone has an opinion on tha Pat Nichols captures the small town in the first book in her Willow Falls series. The little Georgia town is full of opinionated residents who don’t hesitate to voice their opinions when controversy strikes. And there is plenty of drama in Willow Falls. First, there’s the return of Sadie Lyles. A woman who spent the past thirty years of her life in prison for murder. Then there’s the matter of opening the inn and hotel. When news of another venture reaches the town, everyone has an opinion on that as well. And the place to gather and keep an eye on everything is Pepper’s Café (the place where Sadie happens to be working). But the town’s not all bad. When tragedy strikes, the community bands together to show their support as they do when Emily Hayes receives news that changes her life. With so much going on, you might thing it would be difficult to keep track, but Nichols weaves this story so well and gives each character enough uniqueness that I never once felt lost. Which is a good thing when you throw in Rachel Anderson from Atlanta who connects with one of the town residents. The Secret of Willow Inn has a tad bit of mystery in it to keep you reading through the few parts that dragged, but its strength is in the emotions it pulls out of the reader. And as I read happily along, I was hit with a surprise about three-quarters of the way through, an unexpected but good one. I would love to return to Willow Falls when the second book in the series comes out. I loved this book, especially loved the location, as I am from the area. The characters were fun and make you want to be part of their little town. So many interesting stories intertwining one another from Atlanta to the north Ga mountains. A small town murder and several twists at the end. Excellent debut novel. I’m looking forward to more stories from Willow Falls. This fast-paced novel grabs your attention at page one and keeps it all the way to the end. This page turner will have you flying through the pages. I highly recommend this book and I assure you that you won’t be disappointed. I look forward to more novels from this author. I absolutely loved this book! From page one, I couldn't put it down and read late into the wee hours of the morning, until I read The End. I highly recommend it! Visit Willow Falls with Pat Nichols in The Secret of Willow Inn and meet opinionated cast of small-town characters. With them, uncover the truth behind the secrets, experience the tragedy, and feel the hope as the story unfolds in surprising ways. It’s a trip worth taking. At the center of it all are Emily Hayes and Rachel Anderson. Though they have different backgrounds, they can’t help but find several important commonalities over the course of the story. 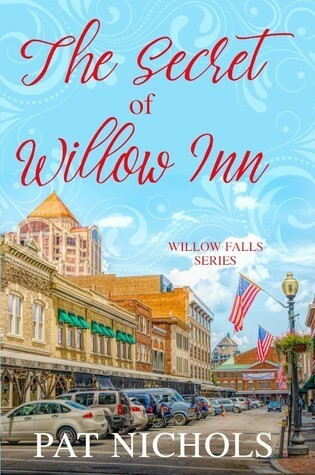 I loved getting to know them—their drea Visit Willow Falls with Pat Nichols in The Secret of Willow Inn and meet opinionated cast of small-town characters. With them, uncover the truth behind the secrets, experience the tragedy, and feel the hope as the story unfolds in surprising ways. It’s a trip worth taking. At the center of it all are Emily Hayes and Rachel Anderson. Though they have different backgrounds, they can’t help but find several important commonalities over the course of the story. I loved getting to know them—their dreams and worries, flaws and strengths, and how they fit within the Willow Falls community—and with their experiences driving the plot of the novel, I enjoyed seeing their growth. And of course, the drama of small-town life heightens and enhances the emotions of The Secret of Willow Inn. It’s a fun, heartwarming book to read, and I’m sure that other readers of small-town contemporary fiction will enjoy it, too. The Secret of Willow Inn was a fast paced romance with a dash of mystery. I enjoy reading southern fiction, especially the work of authors such as Joshilyn Jackson. I don't want to say too much because I am afraid of giving away the surprises in the plot. What I will say is that this book was a very fun and enjoyable read. I enjoy sweet and clean romanc. I also enjoy a bit of mystery. One of my favorite parts of this book was the setting. I have never been to Georgia, but I was able to picture th The Secret of Willow Inn was a fast paced romance with a dash of mystery. I enjoy reading southern fiction, especially the work of authors such as Joshilyn Jackson. I don't want to say too much because I am afraid of giving away the surprises in the plot. What I will say is that this book was a very fun and enjoyable read. I enjoy sweet and clean romanc. I also enjoy a bit of mystery. One of my favorite parts of this book was the setting. I have never been to Georgia, but I was able to picture the small town and all of the unique residents. I grew up in a small town and reading this book made me nostalgic for home. Once I started this book, I was able to read through it very quickly. I look forward to reading more of this series. I enjoyed this story immensely and read it in one sitting. The small town, characters, and story line kept my interest from beginning to end. I really liked the main characters Emily and Rachel as they are introduced to each other because of a common friend and interest in investing in the town. Several twists and turns, romance, tragedy, complicated relationships, and small town drama-all in this clean christian fiction novel. Great characters, great story-highly recommend reading it! I would lo I enjoyed this story immensely and read it in one sitting. The small town, characters, and story line kept my interest from beginning to end. I really liked the main characters Emily and Rachel as they are introduced to each other because of a common friend and interest in investing in the town. Several twists and turns, romance, tragedy, complicated relationships, and small town drama-all in this clean christian fiction novel. Great characters, great story-highly recommend reading it! I would love to read more stories about this town and their characters from this author! If you remember, I spotlighted this book last fall (the end of October to be exact). I chose to do that because the synopsis intrigued me. You aren’t going to hook me by a pretty cover, I might look a second time but that’s not what draws me to a book. You are going to hook me with an engaging synopsis. Bonus points, and faster to the checkout with it, if there’s mystery and intrigue. Romance is just a sidebar, build me a story that I can engage in and romance is just a sidebar. I’m not a bodice If you remember, I spotlighted this book last fall (the end of October to be exact). I chose to do that because the synopsis intrigued me. You aren’t going to hook me by a pretty cover, I might look a second time but that’s not what draws me to a book. You are going to hook me with an engaging synopsis. Bonus points, and faster to the checkout with it, if there’s mystery and intrigue. Romance is just a sidebar, build me a story that I can engage in and romance is just a sidebar. I’m not a bodice ripper type reader. My local bestie? Her go to. I tried to pull her to the plot side, I really did. The synopsis of this book hits all the high notes. Small town (everybody literally knows everybody), big goals, bigger dreams, and something hiding in the backdrop. A secret, a mystery, intrigue. Take my money! I feel like anything I want to share about how much I love this book will just give away vital plot points. I need you to be as taken as I was by this book, and to be surprised as I was (more than once!). Kudos to an author that can catch me off guard, especially multiple times in the same book. I tend to pride myself on figuring things out long before I’m meant to. Not this time. Pat Nichols pulled one over on me twice. Twice! Perhaps, because it has been a minute since I finished reading this book, but I have nothing of which to not gush about. Seriously, I have nothing of which to pick at. Well, let me backtrack that and really nitpick. . . in not a bad way. First, I can’t imagine how the people in Willow Falls had no idea that someone was looking at the property that would become the vineyard until it was put in the paper. I think, in a town this desperate to bring in revenue that would have been a thing. Secondly, Pepper is seriously a whirlwind! Just a smidge of a spoiler for ya here, why on earth would she choose to completely revamp the menu to a high end over the top deal for one night. I felt like they were so desperate that they were willing to set their country roots, their small town charm, to the curb just to attract money. Be who you are, m’kay? For a town with a lot of history, a lot of heartache, they hold on to promise like a toddler with anything that they aren’t allowed to have. Perhaps that’s not the best analogy but I’m going to stick with it. They’ve overcome the shadow of murder, even with the accused out of prison and back in their midst. They’ve overcome the loss of Emily’s parents, their hope for the hotel that was going to be a huge step to saving their town. They’ve even overcome themselves, their bitterness and grudges. With a little help from Rachel, an outsider, they can overcome so much more. Rachel is the key to the vineyard and even the hotel getting back on track. Rachel, who is trying to shed the shackles of her overbearing father, the corporate world he wants to steep her in, and figure out what her own future holds – not the one he has for her. Honestly, ‘The Secret of Willow Inn’ is as much about secrets as it is redemption and of finding self. Everybody needs that now and then. A bit of redemption and a lot of finding self. It has been a while since I have read a true cozy mystery — the kind set in a small, quaint town populated with plenty of quirky characters. That’s exactly what I got with The Secret of Willow Inn, Pat Nichols’ first book in the Willow Falls series. A bonus is that it is set in a fictional north Georgia mountain town similar to the one where I have a cabin. I could picture the shops and the scenery, as well as the hometown feel. Add a many-layered mystery, and this one is a winner. Recommended. T It has been a while since I have read a true cozy mystery — the kind set in a small, quaint town populated with plenty of quirky characters. That’s exactly what I got with The Secret of Willow Inn, Pat Nichols’ first book in the Willow Falls series. A bonus is that it is set in a fictional north Georgia mountain town similar to the one where I have a cabin. I could picture the shops and the scenery, as well as the hometown feel. Add a many-layered mystery, and this one is a winner. Recommended. The town of Willow Falls doesn’t have the many attractions of other north Georgia tourist towns. A waterfall and a decades-old murder can’t sustain the economy. So the whole town is depending on two of their citizens to revitalize the community. Unfortunately, tragedy strikes, threatening to end the dream of a new and improved Willow Falls. But with tragedy comes some opportunities and a chance at a second chance for more than one resident. As stated, I loved the north Georgia setting of The Secret of Willow Inn. But the fictional small town isn’t the only place the action takes place. Atlanta plays a large role as well, and since I have a son who lives there, I could envision the streets and buildings that I am fond of — the Sundial Room and the Alliance Theater being just two. The author does a great job of making the reader see what the characters see. The two main characters, Rachel and Emily, are from very different backgrounds, yet their stories intersect in interesting ways. Secondary characters add great support, and there are a number who fit the quirky title to a T! A number of mysteries unfold, each in a unique way, and I loved how Nichols wove fresh starts, second chances, and forgiveness throughout. The Secret of Willow Inn promises to be just the first of a fun and thoughtful series. I look forward to many more visits to Willow Falls. I absolutely loved this book! The Secret of Willow Inn by Pat Nichols is a story that I won’t soon forget. I only have one problem...book 2 does not come out until January 2020, the third book is still under construction. Knowing it is a laborious process to bring a book to market, I’ve followed Pat Nichols on Amazon, BookBub, Facebook, Twitter, and Instagram so I won’t miss the release announcement. Emily Hayes is expecting her first child and has taken on the project of refurbish an estate int I absolutely loved this book! The Secret of Willow Inn by Pat Nichols is a story that I won’t soon forget. I only have one problem...book 2 does not come out until January 2020, the third book is still under construction. Knowing it is a laborious process to bring a book to market, I’ve followed Pat Nichols on Amazon, BookBub, Facebook, Twitter, and Instagram so I won’t miss the release announcement. Emily Hayes is expecting her first child and has taken on the project of refurbish an estate into Willow Inn, turning it into something that will draw tourists to the slowly dying town of Willow Falls. With her parents, Rachel hopes to open Willow in as a bed-&-breakfast, plus if that isn’t quite enough, refurbish the abandoned hotel as well! To the north, in Atlanta, Rachel works hard and excels as a Vice President in her father’s real estate firm. Despite her success, Rachel is not a happy woman; when an opportunity arises to accompany Charlie Bricker, the manager for the vineyard his father plans to open in Willow Falls, she takes a chance and heads off for a weekend trip to Willow Falls. Willow Falls is a small, southern town where everyone knows everything, almost, about everyone. It is a close knit town full of a variety of people the reader will come to love. Even Sadie Lyles, who has just been released from prison for the murder of the town hero. Very few are willing to accept Sadie back into the good graces of the town, but the local cafe’ owner hires her on as a waitress. Emily does her very best to advocate for Sadie and for the dying town. Emily’s desire to rejuvenate her beloved town doesn’t come without sacrifice nor is the town without it’s secrets...secrets that will be discovered before Willow Falls can begin growing. I selected this book at first because I loved the cover. By the time I finished the first chapter, I knew I was reading something special. This story is so good. There’s everything to love in this small-town, family oriented drama. The story is told through the viewpoints of Emily and Rachel. Emily has grown up in Willow Falls; Rachel in Atlanta. Their lives are very different, but an accidental meeting between the two in Willow Falls changes their lives forever. There’s a great cast of small tow I selected this book at first because I loved the cover. By the time I finished the first chapter, I knew I was reading something special. This story is so good. There’s everything to love in this small-town, family oriented drama. The story is told through the viewpoints of Emily and Rachel. Emily has grown up in Willow Falls; Rachel in Atlanta. Their lives are very different, but an accidental meeting between the two in Willow Falls changes their lives forever. There’s a great cast of small town characters that support the drama in this story. Emily and Rachel face more than one tragedy, and they each have much to forgive. There’s love, faith, redemption, and healing in this storyline and by the time I reached the last chapter, I knew that I wanted to visit Willow Falls again. This is a sweet, clean story with no foul language or embarrassing scenes. There’s a very small amount of social drinking while dining, so be aware of that if it’s an issue that bothers you. This was my first book to read by this author, and I’m looking forward to the next book in this series. What a Delight! I Can’t Wait for Book 2! Pat Nichols’ debut novel just made me happy! No, it’s not a sappy romance, although the prerequisite romantic involvement is threaded throughout the story. Even small towns, as quaint as they are, have their problems, and the busy-body Mirabelle is determined to make sure everyone knows! Who could believe that a heart-breaking fatal accident and a man’s dream of a winery could work to not only miraculously bring together total strangers but actually help he What a Delight! I Can’t Wait for Book 2! Who could believe that a heart-breaking fatal accident and a man’s dream of a winery could work to not only miraculously bring together total strangers but actually help heal the woes of the small town of Willow Falls? There’s just enough mystery to keep one in suspense; what is the secret Rachel’s stern father Greer carries? The great character development of Emily, Rachel, and the sometimes quirky townspeople of Willow Falls makes one feel that you’ve become friends! Highly recommend this fun, uplifting read! There's definitely a lot to like about this first book in "The Falls" series! Having been to Georgia myself, I could easily picture many of the places referenced (though ATL has certainly changed since I was there last). The characters are interesting and quirky. I enjoyed watching Rachel grow in particular. I did feel like her dad, post-climax, turned on a dime a bit. Can't say I'm completely convinced (but maybe he'll show up in a sequel and we will see more character development). I'm also not There's definitely a lot to like about this first book in "The Falls" series! Having been to Georgia myself, I could easily picture many of the places referenced (though ATL has certainly changed since I was there last). I did feel like her dad, post-climax, turned on a dime a bit. Can't say I'm completely convinced (but maybe he'll show up in a sequel and we will see more character development). I'm also not completely sold on Charlie. But, it's only book 1! Sadie is a fascinating character, and I trust we'll get to see more of her, as well as other Willow Falls residents. Definitely recommended. The book sets up the series well and creates an intriguing setting for subsequent installments. I really enjoyed reading The Secret of Willow Inn! The plot twists and turns were well done, & the townspeople were very relatable! I would caution that when I read an advanced copy that one of the pregnant characters took medication that would be extremely harmful in real life. They may have fixed that, if not, don't take those meds while expecting! I would recommend this book as great porch swing read:-) Its one that grips your attention & is true to real, gritty, life. Perhaps it's no I really enjoyed reading The Secret of Willow Inn! The plot twists and turns were well done, & the townspeople were very relatable! I would caution that when I read an advanced copy that one of the pregnant characters took medication that would be extremely harmful in real life. They may have fixed that, if not, don't take those meds while expecting! I would recommend this book as great porch swing read:-) Its one that grips your attention & is true to real, gritty, life. Perhaps it's not a book for everyone with triggers over life's struggles & heartbreaks, but I believe that it's an enjoyable, heartwarming book about second chances. This was my first read by Pat Nichols, but I am in love with her amazing ability to draw readers in. I was hooked from the very beginning, especially because I love how well she captured the small town feel. I truly have a passion for small towns. The characters are well developed and easy to relate to. The story flowed well and was easy to follow. There's plenty of twists, turns, and surprises in this read, which will keep you on your toes guessing. There's a ton of drama and fun, but I never fe This was my first read by Pat Nichols, but I am in love with her amazing ability to draw readers in. I was hooked from the very beginning, especially because I love how well she captured the small town feel. I truly have a passion for small towns. The characters are well developed and easy to relate to. The story flowed well and was easy to follow. There's plenty of twists, turns, and surprises in this read, which will keep you on your toes guessing. There's a ton of drama and fun, but I never felt lost or confused as Nichols magically weaved the story. I found this book hard to put down and highly recommend it to all book lovers! This book is an enjoyable read. It has some suspense, but not the kind that will keep you up nights. Rachel and Emily are two very different people, but so very much alike. Rachel is a high roller business woman in the big city, and Emily is a small town girl chasing her dream of becoming a novelist. You will get caught up in the small town issues of survival, gossip, and revelations. You may think you have the story figured out, but the author throws a couple of curve balls in at the end. The a This book is an enjoyable read. It has some suspense, but not the kind that will keep you up nights. Rachel and Emily are two very different people, but so very much alike. Rachel is a high roller business woman in the big city, and Emily is a small town girl chasing her dream of becoming a novelist. You will get caught up in the small town issues of survival, gossip, and revelations. You may think you have the story figured out, but the author throws a couple of curve balls in at the end. The author has you rooting for the underdog. You will feel a sense of peace when things come full circle. I really liked this author's style of writing and will look for more of her books. Pat has a wonderful style of writing that is easy to read and get into. I enjoyed this story of mystery that involved a decades old murder. I like that it is told from different points of view and that the characters are so unique, giving the reader a taste of different walks of life. This is a well written story about small town life, with all it's secrets. I will caution that there are some triggers in the book, but Pat handles them delicately. I'm glad that this is part of the series, since I Pat has a wonderful style of writing that is easy to read and get into. I enjoyed this story of mystery that involved a decades old murder. I like that it is told from different points of view and that the characters are so unique, giving the reader a taste of different walks of life. This is a well written story about small town life, with all it's secrets. I will caution that there are some triggers in the book, but Pat handles them delicately. I'm glad that this is part of the series, since I look forward to reading the next book! I enjoyed this book. It comes across as a light read but it really isn't. Early on I could guess the outcome and I was right, however, I kept wanting to read to see how it would all play out, so that didn't keep me from enjoying the book and what would happen in this little town and had happened in the past. I loved the ending, but I can't share that, you'll have I enjoyed this book. It comes across as a light read but it really isn't. I loved the ending, but I can't share that, you'll have to read it and see why I loved it. Not just any old business meeting! This book is just full of secrets and twists it will keep you glued to your seat. The author has brought life to her characters and their small town. I will say this book had a bit of everything in its tragedy, suspense, humor, and romance, but faith is there too. It was a great blending of emotions just like real life. I am looking forward to the next book to see what goodies the author will bring to her audience. I did receive a free copy of this book and volu Not just any old business meeting! This book is just full of secrets and twists it will keep you glued to your seat. The author has brought life to her characters and their small town. I will say this book had a bit of everything in its tragedy, suspense, humor, and romance, but faith is there too. It was a great blending of emotions just like real life. I am looking forward to the next book to see what goodies the author will bring to her audience. I did receive a free copy of this book and voluntarily chose to review it. This was a well written mystery that I devoured. It had the dynamic of a small town family drama that really drew me in. My heart went through so many emotions, I was really invested in the characters and the story. The second book can't come out fast enough, I needed it yesterday. You should definitely add this book to your TBR. Disclaimer: I recieved this book from the publisher. All opinions are my own. A wonderful small town saga! This book has romance, mystery, murder, tragedy and lots of hope. The characters are awesome and I love the Willow Falls old-timers. They are quite a hoot! I really hope that there will be more Willow Falls books. I received a copy to review from @justreadtours & @patnicholsauthor. All opinions are mine. I loved this book! It was an entertaining read with small town drama, big city views, and some romance which also comes with family secrets. There were some delightful twists that I didn’t see coming and I’m excited for book two! Oh my, I did not see the ending coming. Well written with quite a story to tell. Thoroughly enjoyed this book. Can hardly wait for more in this series. I received a copy from lpc books as an advance reader copy. Opinions are my own. I loved both the well debeloped characters and the detail of the quaint little town. There are twists and turns in the plot that keep the story interesting. I look forward to continuing the days of Willow Falls. A great, clean read. I couldn't put this down. Small town history and a suspenseful twist or two made this a must read! Enjoyable read! Interesting characters in a definitely interesting town! Pat Nichols is thrilled to prove it’s never too late to follow your dreams. During the spring, summer, and early autumn of her life this side of heaven, she and her high-school-sweetheart husband struggled and triumphed through life’s ups and downs. They raised two children, delighted in three grandchildren, bought a Corvette, and ticked off every item on their travel-bucket list. Now approaching Pat Nichols is thrilled to prove it’s never too late to follow your dreams. During the spring, summer, and early autumn of her life this side of heaven, she and her high-school-sweetheart husband struggled and triumphed through life’s ups and downs. They raised two children, delighted in three grandchildren, bought a Corvette, and ticked off every item on their travel-bucket list. Now approaching her winter years, she ignores the minor aches that come with age and is grateful she can still paint her own toenails and dance with her hubby. More importantly, she is drawing on her years of experience to launch a second career as novelist and freelance editor. She chose women’s fiction to honor her daughter’s strength in the face of significant health issues, as well as the hundreds of amazing women she worked with during her corporate career. Although she writes five days a week, she and Tim—who is her number one fan—continue to delight in their fifty-plus year marriage. They lead a small group, volunteer for church guest services, participate in two social organizations, and spend time with family and friends. She thanks God for the blessings that brought her joy and the challenges that continue to strengthen her faith, skills, and resolve. Pat is a member of American Christian Fiction Writers, Word Weavers, Christian Pen, and Gwinnett Church (a campus of Northpoint Ministries).